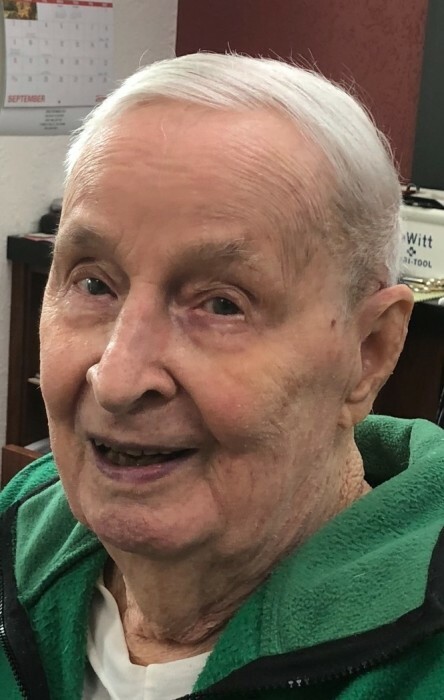 Poland – A prayer service will be held at 9:30 a.m. Friday, April 12, 2019 at the Clemente Funeral Home in Struthers with a Mass of Christian Burial at 10:00 a.m. at Holy Family Church in Poland for Thomas A. Chuey, 92, who passed away on Monday afternoon, April 8, 2019. Thomas was born April 18, 1926 in Youngstown, Ohio, a son of Andrew R. and Mary H. Bunofsky Chuey. He lived in the area his whole life and served in the United States Army during WWII in the Pacific Theatre in Okinawa. He earned a Bachelor’s Degree in English from Youngstown College and pursued further education at Duquesne University. He worked as a teacher in the Struthers School System for five years and moved on to become a locomotive engineer for the P & LE Railroad for 43 years before retiring. He was an avid gardener and sports fan of Notre Dame. Thomas married the former Patricia A. O’Neil on December 2, 1972. Besides his wife of Poland, he leaves one son Thomas P. Chuey O’Neil of Poland; one daughter Susan A. (Jeffrey) Chuey Harb of Strongsville, OH; twin granddaughters, Sara and Sophia, also several beloved nieces and nephews. He was preceded in death by his parents; one brother Ralph B. Chuey and a sister Rosemary Hromyak. Friends may call on Thursday April 11th, from 4:00 to 7:00 p.m. at the Clemente Funeral Home in Struthers.